I love trying new kinds of coffee and when I saw this Coffee of Hawaii, I knew that I had to give it a try. They sell coffee in many varieties! The coffee is so fresh and nice and rich. I got to try the Maui coffee, Kona coffee, and Moloka'i cofffee. They are all very tasty! GIVEAWAY: The company will give one reader a bag of their delicious coffee! The contest is open until midnight Friday August 13th. The winner will be chosen on Saturday August 14 via Random.org. 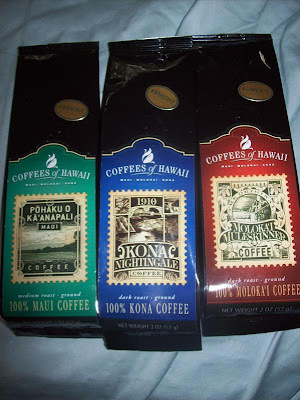 Mandatory: Visit Coffee of Hawaii and tell me which flavor you would like to try! YOU MUST LEAVE YOUR EMAIL ADDRESS IN EACH COMMENT SO I KNOW HOW TO CONTACT THE WINNER. And extra entries must be left as a separate comment. -Subscribe/add me to your blogroll (1 entry) and leave a comment telling me you did so. I would like to try the Kona blend. I am entered in your Jewelry Stylist Tear Drop Earrings Giveaway. I am entered in your Trading Phases giveaway. I am entered in your Missiko Hair Care giveaway. I am entered in your cultured care gum giveaway. I am entered in your Right on the Walls giveaway. I was in Hawaii last November and fell IN LOVE with their coffee (it's hard not to). I'd have to go for the Kona Nightingale because Kona coffee is definitely my favorite. Thanks for the giveaway! I can't remember how I found your blog!! Maybe through Erica from Itzy's Kitchen?? I think my husband would like the Kona flavor! I'm not sure how I found your site but I think by clicking on a comment you may have left on another blog I read?? I'd like to try the Ka'u coffee. I found you through a giveaway linky at The Mom Reviews. I'd love to try the Hawaiian Island Style coffee. Thanks for the review and giveaway! I used to live in Kona and the coffee is amazing!!! I would totally choose the 100% Kona Coffee! I subscribe through email too! I linked this up to my blogs sidebar! I found you after you commented on my blog!! I am entered into the Trading Phrases giveaway! I am entered in the Right on the Walls giveaway! Hi, I am your newest follower from the Thursday Friends bloghop :) And I thought I'd enter this great giveaway while I'm here :) No question I'd love to try the vanilla macadamia blend, nom! Ooh, I already told you this but I should leave it as a separate comment/entry :) I found your site from the Thursday Friends and Giveaways bloghop! I would love to try the Moloka'i Island Princess! You are in my blogroll! I found your site after you found mine! Thanks for commenting! I would love to try the Kona Nightingale. I'd like to try the Maui coffee. I found you via Surfin Saturdays - I am following you back. I want the maui coffee! I'd love to try the Kona Peaberry - sounds luscious! I found this giveaway through Networking Witch's giveaway linkup. I'd like to try the toasted coconut! I found this site by checking out the Saturday blog links! I follow on Google Friend Connect! I follow you publicly on google and I'd like their Kona Coffee and the black cup and saucer. Hope I win. Thanks. I would try the Toasted Coconut flavor! I found you through Fitnessista! I entered the gourmet salts giveaway! I would like to try the Vanilla. I am a new subscriber. I entered the Chocolate giveaway! I entered the salt giveaway! I would like to try the 100% Maui Mokha in Regular Blend. I found your site from a tweet from @SaucyMamaCafe.